Like before, Hordes can often provide all of the same species, and even sometimes introduce one Pokémon into the horde which is different to the others. This game also introduces several areas where only one Pokémon will appear as a horde, making them perfect for EV training. 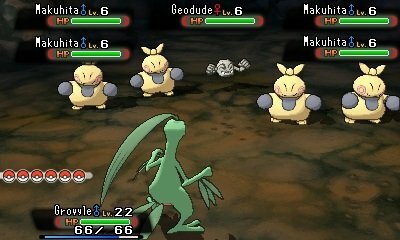 Like before, when you have a horde encounter, you will not always see five of the same Pokémon. In these circumstances, you will see four of one Pokémon and one of another. In these situations, you will often find a variety of special instances. For example, in hordes of Seviper/Zangoose and Heatmor/Durant, the species that are the more plentiful will attack the one Pokémon. In others, the Pokémon will help boost eachother. A new variation of the Horde Encounters is introduced in this game, however. 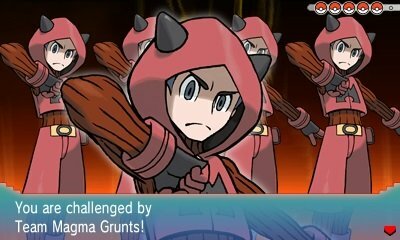 In this game, you will sometimes be attacked by multiple trainer characters, such as a group of Team Aqua/Magma grunts at one time. These trainers will then send out five Pokémon to face you at a time. The mechanics work similar to before, with various moves being able to hit all Pokémon, so you need to plan ahead. There are only two instances of this in the game, but they employ strong strategies such as using 5 Mightyena, each with Intimidate and Snarl.